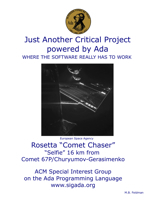 The Special Interest Group on Ada (ACM’s SIGAda). 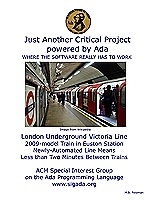 pointers to current information and resources for the Ada programming language. SIGAda is pleased to announce that Brad Moore and John Hamilton received SIGAda's awards for 2018. Brad Moore, a Software Engineer at General Dynamics Missions Systems Canada, received the Robert Dewar Award for Outstanding Ada Community Contributions. John A. "Drew" Hamilton, Jr., a Professor at Mississippi State University, received the ACM SIGAda Distinguished Service Award. The awards were presented during SIGAda's High Integrity Language Technology (HILT 2018) Workshop, held in Boston, MA, November 5-6, 2018. Brad Moore is the author of concrete open-source artifacts in Ada, most significantly "Paraffin," a suite of Ada 2012 generics that facilitate iterative and recursive parallelism for multicore systems, and provides safer recursion for single and multicore systems. He has also been a vocal proponent of creating new support for parallelism in Ada, which will be integrated in the next version of the language. Moore has also been a contributor to the Ada standardization and language maintenance process, and has been an author and tutorial presenter in various conferences and workshops including Ada-Europe, SIGAda and the International Real-Time Ada Workshop (IRTAW)—where he also served as the 2018 Program Chair. John A Hamilton, Jr., a member of SIGAda since 1988, has been an active and influential organizer of SIGAda initiatives for decades. A former Lieutenant Colonel in the United States Army, Hamilton served as the Chair of the Ada Software Engineering Education Team (ASEET). ASEET provided education and training in Ada at all US service academies and military training centers. His service with ASEET also included chairing several conferences. As the last Director of the Ada Joint Program Office, Hamilton facilitated the transfer of Ada technology from the government to the private sector. Hamilton is also recognized for authoring several influential publications and developing lecture notes, exams and projects that have been used widely in Ada education. He is currently serving as Chair of SIGAda through 2021. 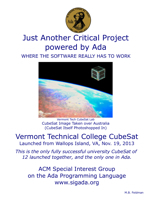 ACM SIGAda is the Special Interest Group on Ada, a part of ACM. SIGAda is a powerful resource for the software community's ongoing understanding of the scientific, technical and organizational aspects of the Ada language's use, standardization, environments and implementations.